The menu is very quick and easy for users to navigate. It is very easy to install and set-up. A very easy to install piece of software; the readme explains in detail, but it's basically just upload-and-go. Just a few lines to paste into a couple of byz files and the shoppage_header.htm file (explained in the readme document that comes with the software). The out-of-the-box config options will be what most merchants want, but you also have the options of changing how the + and - icons and the text links work (ie do you want it to expand/collapse, and/or navigate as well? - you can choose what you want it to do, and you can make the icons do something different to the corresponding text links too. 02 16-NOV-2007 Fixed query syntax for some permutations of configuration setups that were in error. Changed database connection logic to avoid multiple connections and to speed up the processing/loading of the menu. Added multi-language support and various other configuration related criteria. 03 18-NOV-2007 Changed to cater for Internet Explorer bugs which caused some items are not secure messages when using on SSL. 04 21-APR-2008 Took out some error traps that were spuriously reporting on generic vpasp sql errors when displaying categories with no products in them. Rearranged files and changed to avoid warnings/errors when running through HTML validators. NOTE: To upgrade to V06 or later of BYZ137, you must ensure youre using BYZ038 V13 or above first. 07 06-SEP-2011 Added configuration options so that parent categories (ie expandable ones) can optionally be linked to relevant pages so that when users click on an expandable (non-bottom level) category they can be taken to the relevant category page. There are now various configuration options for the + and - icons and the text links which allow you to choose whether you want the branch to expand/collapse, and/or to navigate to a relevant page. You can configure the + and - icons to use different expand/collapse/navigate options to the text links. Added extra logic so that BYZ137 is now also compatible with BYZ164 (static category pages). Changed cursor/query logic to use less memory and to speed up the query. NOTE: To upgrade to V07 or later of BYZ137, you must ensure youre using BYZ038 V14 or above first. Corrected problem where the branches being expanded were not always being correctly remembered/restored via the cookie. Added extra config option and logic to allow encoding for special characters (like ampersands) in category descriptions when displaying the text link text. 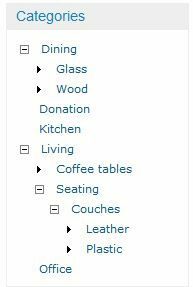 Added extra config option to allow the category query to restrict the categories that are returned (eg to exclude certain categories). Changed to use a more efficient method to check if a static file exists for a category when using BYZ164. Got rid of spurious styles in the stylesheet that the addon was not using. Took out the byz_ecm_virtual_vpasp_location config option and replaced corresponding usage with the BYZ038 byz_sys_vpasp_virtual_folder config option instead. NOTE: To upgrade to V08 or later of BYZ137, you must ensure youre using BYZ038 V15 or above first. 09 03-MAY-2012 Changed to use the new BYZ038 functions where appropriate. Changed so that more than one menu can be displayed on the same page. Please Note: You must be using V16 or later of BYZ038 before upgrading to V09 or later of BYZ137. BYZ137 V09 or later will not work with V15 or below of BYZ038. Please Note: If upgrading from a previous version of BYZ137, note that the BYZ_ECM_LOADMENU function call (which may be in your header file) now has an extra (second) argument, see the installation notes for more information.